I've started to work through a series of "lasts". Most of them are oblivious to me until after the event. Last Friday, for instance, was the last one of my present job, and hence the last time I'll ever feel that rush of release as I step out of the building and into the weekend. My trip out to the Wirral eight days ago was the last I'll see of the Irish Sea for, I'd imagine, a fair few years (and the same probably goes for the sea itself). I would imagine I've also taken the last bus over to the giant Tesco on Allerton Road, which is just as well given the last couple of times the driver has got lost and I've had to show him the way. In each case I wasn't fully aware of the finality of my actions until much later, I suppose because I was too distracted at the time to pay enough attention. But yesterday's "last", the last time I'll ever go to get my hair cut in Liverpool, was one that I embarked upon knowingly and, it has to be said, something of a heavy heart. I don't particularly like going to get it cut, not that it takes any longer than ten minutes, and I've always made a point of going first thing of a morning (when possible) so I can have the thing done, come back here, have a shower, and start the day again. Yet I've been going to the same place for just over 10 years. Given I tend to go every three to four weeks, I reckon that adds up to at least 150 cuts. And given the price averages out at £5 a time, that makes for a grand total of around £750. There's an investment for you. During that time I've lived in four different places in Liverpool, each further away from Penny Lane than the last, but I've never once considered getting my hair cut somewhere else. It's the convenience of familiarity. It's the reassurance of walking into a place, recognising the faces of the staff, knowing the kind of job they'll do, and not having to think any more about it. The peace of mind which routine brings. All of which made yesterday's final cut a particularly poignant occasion. Not that I made anything of it while I was there, or said anything to the staff - oh no. You introduce bits of your personal life into a tonsorial transaction at your peril. No, it was before and after that I felt the most emotion, I think because the whole process was such a tangible illustration of how my life is changing and how every single thing I've come to take for granted is about to be thrown up in the air and fall back to earth reassembled as...well, who knows. 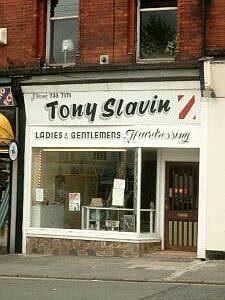 So farewell to the otherwise unknowing personnel of Tony Slavin's on Church Road on Penny Lane roundabout. I'll miss the friendly and efficient service, the shameless Beatles photocopied prints, the giant photo of when Jamie Redknapp and Jason McAteer dropped in, the buses of tourists passing by with flashbulbs popping, the harmlessly trivial overheard chit-chat about lotteries and school uniforms and car tax and obscenities in pop songs and the weather, and the very fact it was always there, always open and always the same.